It’s hard to believe how quickly 12 months can go by. It feels like just yesterday my phone rang, and I was hearing those incredible words: "Hello, Jon. Congratulations! You have been selected as the 2016 Ride of Pride driver." I was shocked then, and honestly I still am. There were only a couple weeks between when I was notified and when I picked up the amazing military tribute truck I would drive more than 70,000 miles over the course of a year. During my time as captain of the Ride of Pride, a lot of people asked if the truck has a name. The first time I saw it, I knew it must be called Valor. I had researched the names of past Ride of Pride trucks like Freedom and Patriot and knew I wanted to stay in the same theme, but it was the imagery on this truck that locked in the name for me. From the D-Day Battle of Normandy imagery to a helicopter landing in Vietnam and a patrol in the mountains of Afghanistan — they all represented great acts of valor. 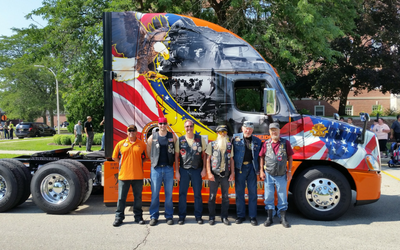 The first miles Valor and I put on were for the Rolling Thunder tribute ride to Washington, D.C., on Memorial Day weekend. The emotion, the pride and the respect I experienced at this event would be repeated time and time again throughout my time as the Ride of Pride driver. Each of the events I’ve attended have been unique and special in their own way. 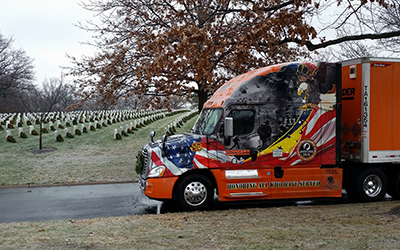 However, much like last year’s Ride of Pride driver, Wreaths Across America is one event I will never forget. The show of support, the meaning behind the event, the memory of the service members who made the ultimate sacrifice were truly astonishing and emotional. Even less than pleasant weather could not stop people along the route from welcoming us by lining the roads, waving flags and honking their horns. Regardless of where Valor and I traveled, I quickly lost count of how many people have gone out of their way to approach the truck and express their gratitude by shaking my hand — not only for my service in the military but for all the men and women who have and who continue to serve. I cannot even guess how many times while driving down the road that passers-by would give me a thumbs-up and a wave. It was truly touching, and I want all military personnel past and present to know you are very clearly appreciated by so many. Throughout this past year, I have talked and listened to thousands of people. I have laughed and wept. I have spoken with people who simply appreciate what the truck and my role in driving it stand for, and I have met people who have a sincerely deep connection to those in the military — sometimes through the loss of a loved one. Another noteworthy part of my experience was that I was the first Ride of Pride driver who also hauled freight during the annual tour. This meant I could bring the truck to places that no one would have seen it until the tour ended. At some deliveries, employees would say, “Wait right here, our manager has to see this.” It was also great to connect with other Schneider associates, drivers and customers with the truck. Working with field recruiters at driving schools was another highlight of the experience. I always say that once you find out what’s going to work best for you and your family and your goals, you’ll be happier and more productive in the long haul. One of the reasons I’m so proud to work for Schneider is that they help you find and accommodate that sweet spot. It’s also a great honor as a veteran myself to be part of a company that appreciates current and former military service members. I can’t share my gratitude enough for the opportunity to represent Schneider in one of the most honorable ways possible. Roughly a year ago I received a call telling me that I was selected to be Schneider’s Ride of Pride driver. It still feels like a bit of a dream. Thank you to everyone who made this an experience to remember and, of course, thanks to all those who have served and currently serve in the military. You are our heroes. Thank you to those who serve. Schneider values service members by offering extended benefits and differential pay. See what else we have to offer. Did you get a chance to meet Jon or Valor over the past year? If so, tell us about it in the comments. If not, make a point of trying to connect with next year’s truck, which you’ll hear more about soon! 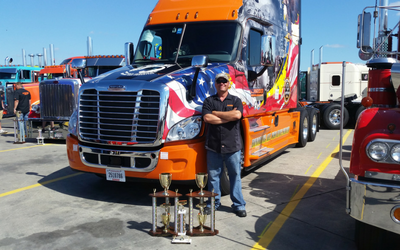 Jon Ritscher of Crown City, Ohio, has been with Schneider since 2013 and is currently the driver of the 2016 Ride of Pride military tribute truck. He served in the U.S. Army for eight years as part of a support unit that provided fuel to aircraft. His service included two tours in Iraq. In his free time, Jon enjoys spending time with his wife and young son.